Building Community Through Arts (BCA) can be regarded as a training and personal development programme, using listening and facilitation skills to celebrate our common humanity, creativity and diversity. BCA was developed as part of Kew Studio’s outreach work in a series of projects from 1993 – 2002. 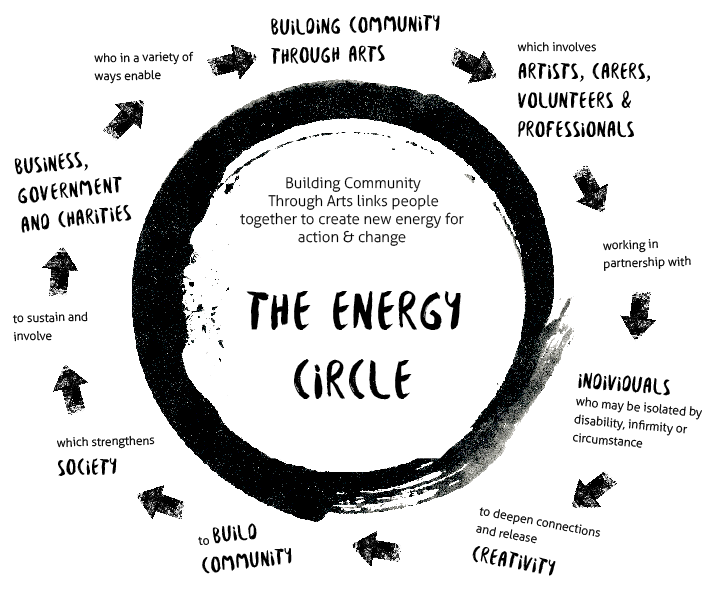 We’ve made available on this site, a set of free resources for use by anyone wanting to develop their own community through arts. Do get in touch if you want to share your projects or ask a question. The downloadable documents on this site will give you processes for developing authentic connection with other members of a group, which improves the quality of life for all those involved in living and working together. There are several documents available for facilitators with detailed programme plans and workshops. Please contact us or explore the site for more as we work on adding more material for you to use. is a process that has been developed over nine years by a multi-disciplinary team to address issues of isolation and fragmentation in our society. It became the outreach programme of Kew Studio, an arts educational charity, and specialised in using the arts media to build community. Scott Peck in The Different Drum describes his own experience of the ‘isolation and fragmentation that have become the order of the day.’ The aim of the BCA approach is to combat the forces that separate people from each other, and disintegrate society. The methods seeks to enable people from differing backgrounds to communicate more effectively, to release their innate creative gifts and enable others, in turn, to find greater enjoyment. In order to cross boundaries with awareness and skill, a multi-disciplinary team came together. The team drew on professional experience in the community and the arts, facilitation, social psychology, documentation, education, the voluntary sector and business consultancy. They were a group of individuals involved in action research, building on their own experience with clients, while drawing on a wide range of consultants and authorities. We worked in partnerships with social welfare organisations, education and business community volunteers, using the BCA process to bring people together to confront issues of isolation and disempowerment within their communities. With all participants the team explored and sought to enhance their working and social relationships. They used the arts as a medium to validate each person’s contribution and helped the groups to relate to each unique story. BCA developed within its process a version of Co-operative Inquiry, which entails a cycle of Idea, Action and Review. 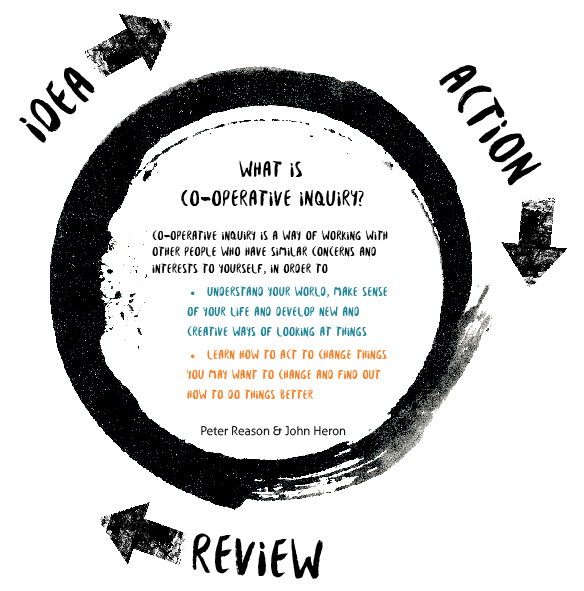 One of the BCA team had been working with John Heron, co-author of the cooperative inquiry model, and early in the development of our work offered a framework of shared enquiry which enables groups to move from the implicit to the explicit, allowing all involved to take part, to question and to be creative. The method is simple: You frame an issue or an area of enquiry, you experiment, you review your progress and results and you move on to the next agreed area/idea. The team, with each new client group, set about creating a collaborative learning culture, in which people could relate to each other on a personal level and support each other to take risks trying out new ideas and behaviour. Within each session, participants worked in threes, taking turns in the roles of Artist, Facilitator and Observer. 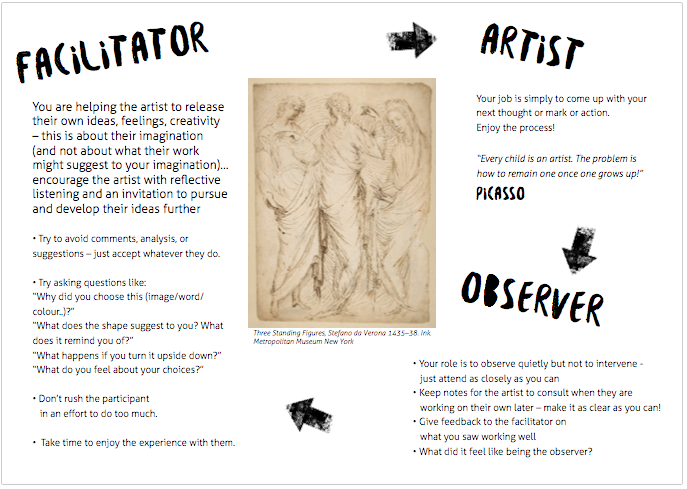 This opens each up to the different aspects of art making and of living. You can read more about the benefits to Social Care, Business and Educational organisations at the respective links. There are also a collection of downloadable Case Studies PDFs. Discover more and start your own project with our extensive Resources, Articles and Inspiration!